If you’re like many Americans, your pets are as much a part of your family as the kids. They love you unconditionally, they think you can do no wrong, and they seldom roll their eyes at you. While their furry little selves can be a comfort to their humans, they can also have quite the impact on the air quality inside your home. Over 60 percent of households today include pets, with many of the animals spending all or at least part of their time indoors. Since our furry friends clearly aren’t going anywhere, the next best bet for an animal lover is the use of an air purifier throughout the home. When people have allergies to animals, it is not the actual hair they are allergic to but the dander from discarded skin cells or fluids secreted by the animal that attaches to the hair. These are the actual allergens causing the reaction, however it is so small that we often assume that the larger particle that we can see, the pet’s hair, is the cause. The dander can adhere to just about any object throughout the house, including furniture, walls, carpets and other flooring. The animal doesn’t need to be in close contact to the area where the allergens land as the small particles can be airborne for quite some time. The fluids are often produced through urine and saliva and can remain on surfaces and in areas where there has been contact. Both the fluids and dander easily attach themselves to a pet’s coat. Dander and the allergens in fluid are both micro in size and can be difficult to eliminate. A person cannot locate them with the naked eye and so often doesn’t even realize the severity of the issue in their home. It can take reoccurring respiratory ailments or allergy attacks before many realize the source of the issue is in their own living space. Asthma sufferers can be affected greatly by this. About a quarter of those with asthma have allergies to animals or have severe sensitivities, which can result in tightening of the chest and wheezing when they come into contact. Since dander can remain in the air for a while, cleaning surfaces have no effect on removal of many of the allergens. Air purifiers work specifically to remove these small particles from the air, decreasing the occurrence of both respiratory and dermal ailments. Due to its lightweight size, dander is easily transferred. Even if you do not have pets, there is likely dander in your home, as well as in public spaces that you frequent such as schools, stores, offices and hospitals. Petting, holding or being licked by an animal is a surefire way to become a vehicle for it but even visiting an area where dander has been present can result in the same. The airborne particles can attach to ­hair and clothing, moving into your personal space with you none the wiser. While traditional cleaning methods do make an impact on the air quality of your home in relation to pet dander and the allergens that come with it, it may not be the impact you are thinking. When you vacuum or dust, large surface pollutants may be removed but many times allergens that are too small to be visible are sent flying. Disrupting areas in your carpet where dander has settled can actually increase the amount of allergens that become present in the air you and your family then breathe. Coupling traditional cleaning methods with a filtering system assists in removing these disrupted particles from the air quickly before they find their way into your lungs. Having an air purifier in the home can be as advantageous to your pets as to the human residents. It is not uncommon for animals to have allergies themselves and removing allergens from the air can help to reduce their symptoms, such as scratching, biting, or licking their paws and legs. Animals, especially those of the smaller variety, can also be sensitive to chemicals released from cleaning products and synthetic fragrances. Mold particles can also cause detriment to your furry friend. When pollutants are removed from the air, their respiratory system benefits much in the same way yours does. Having pets in your home should be a positive part of your life without causing worry as to how their dander is affecting your indoor air quality. Making a simple change such as placing an air purifier in your home can help you and your pets breathe easy and maintain a clean and healthy lifestyle. Most people love their pets and consider them to be part of their family. However, pet hair and pet dander can often be quite troublesome, especially if a family member or friend has pet allergies. Suddenly Fido or Fluffy has become more of a challenge than a beloved pet as you’re constantly trying to remove pet hair, and trying to keep your pet away from anyone who is allergic. A helpful solution can be to add an air purifier for pet dander and pet hair. An air purifier can help to remove pet hair and pet dander from the air. Depending on the severity of the person’s allergies, an air purifier can sometimes be enough to let them be in the same room with the family pet. It may even be enough for them to be able to stay in the house for a weekend. While there are other things you can do to help someone with pet allergies, adding an air purifier is a great place to start and can definitely help to improve the situation. Not every air purifier will remove pet dander and pet hair, so you’ll want to double check to make sure that your air purifier can do the job. If the air purifier does remove pet dander and pet hair, like our MinusA2 with the Pet Allergy Customized filter, the best solution is to put the air purifier in the room where the person with allergies will be spending the most time. This could be the guest bedroom, the family room or another room that you choose. Because the MinusA2 is portable, you can move it around as the person’s needs change during the day and evening; such as putting the air purifier in the guest bedroom at night and the family room during the day. Remember that air purifiers clean the air in a room several times an hour, so if you move the air purifier into the guest bedroom half an hour before they retire for bed, it will have cleaned the air a few times so that they can get a good night’s rest. There are additional things you can do to help the person with pet hair and pet dander allergies, while also helping your air purifier. One of the best things you can do for pet allergies is to be an enthusiastic vacuumer. Thoroughly vacuum your home, even the cushions of the couch. Try to remember to vacuum areas that Fido or Fluffy has been in with extra care, as these will have more pet hair and pet dander. Vacuum once or twice a week for best results if you find that pet hair and pet dander bother someone you know. 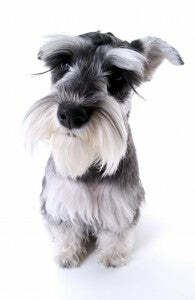 Another helpful thing you can do for pet hair and pet dander is to stay on top of pet grooming. Your dog should be groomed regularly, which includes getting a bath. Simply bathing your dog will help to remove allergens. Please do NOT bathe your cat…you’ll probably regret it as much as the cat will! But if you have a long haired cat you can help remove pet dander while enjoying some quality snuggle time by brushing it regularly and gently. The cat will enjoy it, and you will breathe easier! If your pets go outside, they may also bring allergens into the home. They may come in with wet fur from the rain, or with leaves and grass in their fur, all of which have the potential to aggravate someone with allergies. As your pet comes in take a moment to run a paper towel along their back. Remove anything that comes off – leaves, grass, etc – and toss it into the wastebasket. 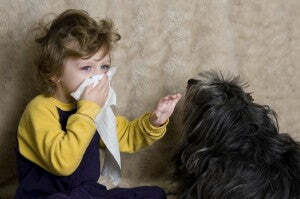 This will also help to keep allergens at bay and your friends and family breathing better.